For a change of scene, I thought I'd post about north coast beaches in Crete. The north coast is much more developed than the south, in terms of roads, airports, hotels etc. As a result it is much much busier. 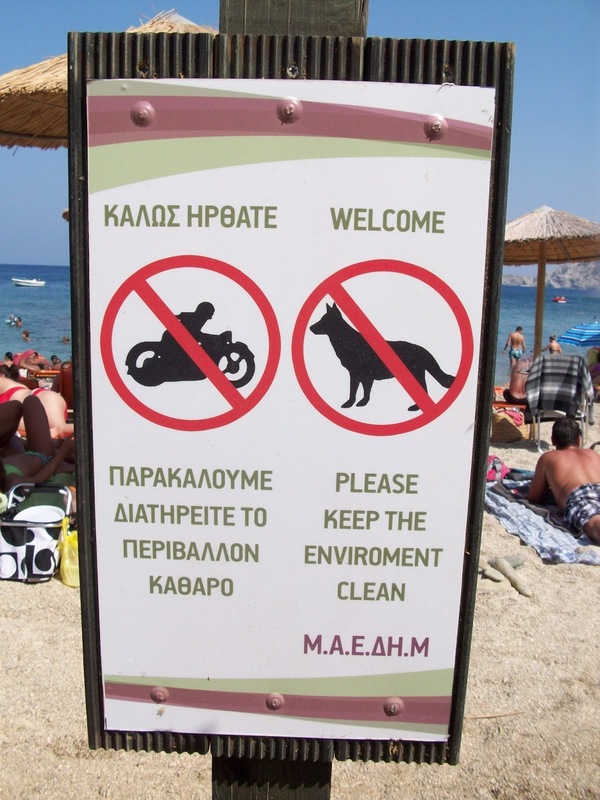 The laws in Greece concerning dogs on beaches seem to me a little bit vague. Officially, unless there is a sign stating otherwise, pets are permitted on Greek beaches, if they are on a lead and you carry their health book (to show they have been vaccinated etc.) In reality, the general rule seems to be: busy beaches 'no', more isolated beaches 'yes'. 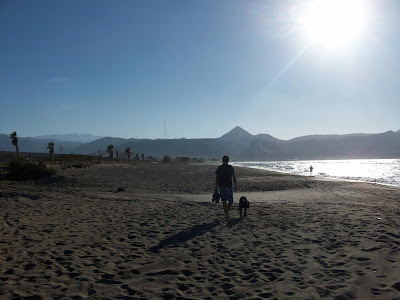 Even more in reality, I don't know any dog owner in Crete who has not got into trouble at one time or another for having their dog on what they believed was an isolated beach, away from other beach goers. My story was at Tsoutsouras Beach, south east of Heraklio. We were sitting far away from the last sun chair and tourist shop, when an officious man in uniform (maritime police?) came and shouted at me, took my details, and told me repeatedly that it is against the law to have your dog on ANY beach in Greece. At the time I had not researched the matter, I just assumed that if you were out of the way of others, and didn't leave any mess behind, then it wouldn't be an issue. He never followed it up, but it made me quite nervous to take Sage with me to any beach. I have heard similar stories from the beach at Kommos (also south of Heraklio), and several others. From http://www.cretanbeaches.com: The animals are generally unwelcome in all crowded beaches of Crete, although they are allowed by law. However, if you go to a secluded beach, nobody will disturb you. It is obvious, of course, that you must take care of your pet and keep the area clear. Also, you must have the certificates of your pet (health card) because you may be asked. Dogs have the right to come on Crete beaches, unless there is a Municipal or Prefectural sign indicating otherwise. According to Law 3170 of 2003, you can walk your dog in outdoor areas (i.e. including beaches) as long as it is on a lead and you clean up after it. You should also carry its health book with you to prove it has been vaccinated if requested to do so. Since my girl is big (and beautiful), I've decided to play it safe, and avoid all beaches where there are sun chairs/umbrellas/cafes and generally lots of people. Luckily, I prefer the quieter, hidden away beaches on the south and east coasts anyway. For those looking for a livelier beach experience, I strongly recommend you leave your dog at home (or your dog-friendly hotel), to avoid confrontation, especially in the busy months of July and August. Ok ok, this photo makes Ammoudara (behind the Pankritio Stadium) look like a tropical paradise... and I must admit, that is not how most people would describe it. On the other hand, we found this beach really convenient. For a start, it is not organised (i.e. no sun chairs and umbrellas in this section of the beach). There are never that many people there, even in August. Every time I went, I saw other groups with their dogs on the beach. 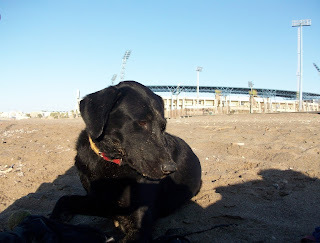 It is a large, long sandy beach, so you can find a place to relax with your dog. And finally, some parts of Ammoudara have been awarded a Blue Flag (http://www.cretanbeaches.com/Information/Suggestions/blue-flag/), but I'm not sure this applies to the section I'm talking about, nearest to the city, behind the Pankritio Stadium. We discovered it because we were staying close by there in a friends' studio, but it is not well known and most residents of Heraklio don't know about it. There is a pretty fish taverna close by, right on the beach front - Ta Kalutera (The Best), but sadly we didn't get a chance to try it out. 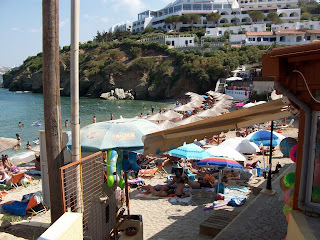 Another north coast beach I have been to with Sage is Fodele (also in the Heraklio region, also awarded a Blue Flag). This beach is convenient for you and your dog for the same reasons (not organised, not many people, often other dogs on the beach), although it is a bit smaller than Ammoudara. This beach also has the benefit of being close by the national highway between Heraklio and Rethymno, so can provide a good break from the car. There is a small cafe by the car park. A final fairly dog-friendly beach I have been to on the north coast is Pacheia Ammos, Lasithi region. This is a pebbly beach, with no sun loungers/umbrellas etc. I always feel very sorry for the residents and cafe owners, as this beach has an annual problem with rubbish swept in from the sea due to the currents. Not to make light of their misfortune - this does mean that it is not a very popular beach with visitors, so you can usually sit there undisturbed with your dog. 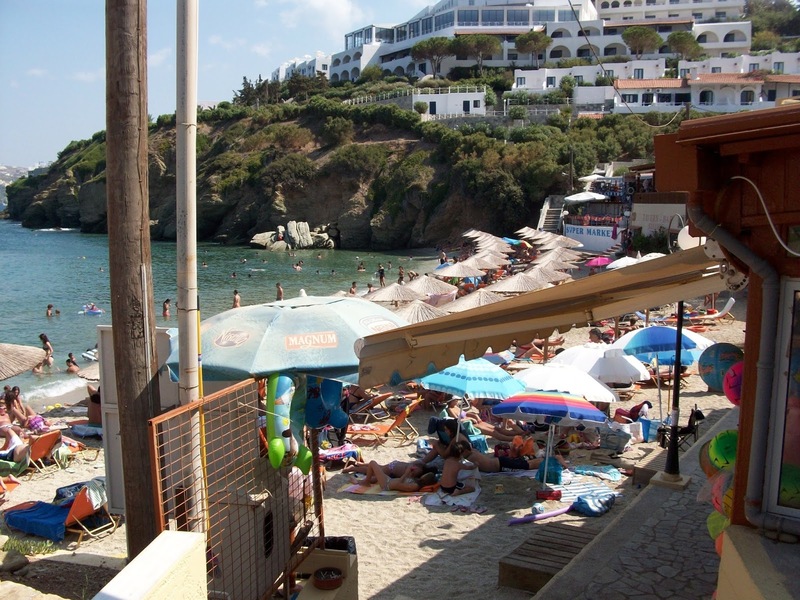 There are numerous cafes and tavernas along the beach front, and the surrounding landscape is spectacular. It is also very close by the Heraklio-Lasithi highway, and makes a very useful stop-over on long journeys east. I am sure there are many other similar north coast beaches, as well as strips of more rocky coastline where there is not much development. These are 3 that I have found to be very convenient and dog-friendly.